After waiting through the cold, dark months of winter, summer is finally here! Sunlight, warm breezes, and overflowing gardens make summer a season worth savoring. If you feel like your home is still stuck in winter’s rut, consider a few of these simple changes to bring the spirit of summer to your living space. One of the best aspects of summer is the sun. After waiting all winter for the sunny days of summer, you may be tempted to ditch the drapes entirely and let the sun stream in. Too much sun can cause your home to heat up and put a strain on your air conditioner. Swap out dark, heavy drapes for lightweight, light blocking options. Closing drapes and blinds while you are away from home or in the late afternoon can prevent your home from heating up unnecessarily. Having fresh flowers on the table makes your home feel fresh and bright. Plant your favorite flowers outside to provide beautiful blooms for indoors as well. Perennials like roses, tulips, irises, and peonies provide large, fragrant flowers for bouquets. Don’t overlook flowering trees. Apple blossoms and dogwoods can also add beauty and interest to your tabletop. In the wintertime, a well-placed area rug can bring an element of warmth to your living space. In the summer, especially on cool breezy days, removing carpets can make a space feel more open and airy. Carpeting is notorious for holding humidity and allergens, so stashing area rugs away for summer can help brighten up your home. All winter you’ve been cozied up to the fire. For the summer months, rearrange your furniture and turn the focus away from the fireplace and toward the windows and that gorgeous natural light. The best part of summer is the ability to spend time outdoors. Forego the dining room and hold your next dinner party outside. Upgrade your outdoor lighting and seating to provide a comfortable and functional entertainment area. By grilling dinner and holding your party outside, you can take advantage of the cool evening air and avoid the heat of the kitchen. If areas of your home, such as flooring, cabinets, or walls seem too dark, consider a new, lighter shade of paint to open up the area. Lighter colors make a room seem larger, more open and airy, and brighter overall. 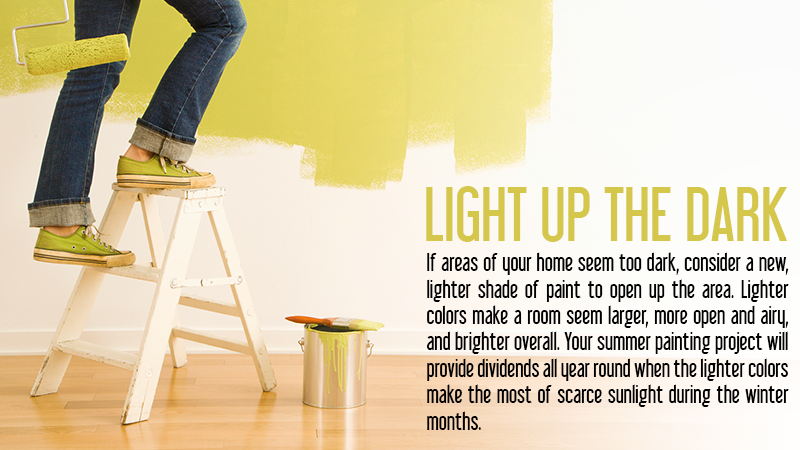 Your summer painting project will provide dividends all year round when the lighter colors make the most of scarce sunlight during the winter months. If you feel like your home just isn’t as comfortable as it should be, contact Classic Air Inc. for an A/C repair or maintenance tune-up. Our prompt, courteous installers are highly trained and we offer 24-hour, same day emergency service for all of your HVAC needs. Call Classic Air Inc. at 614-476-1732 for a free consultation and quote.